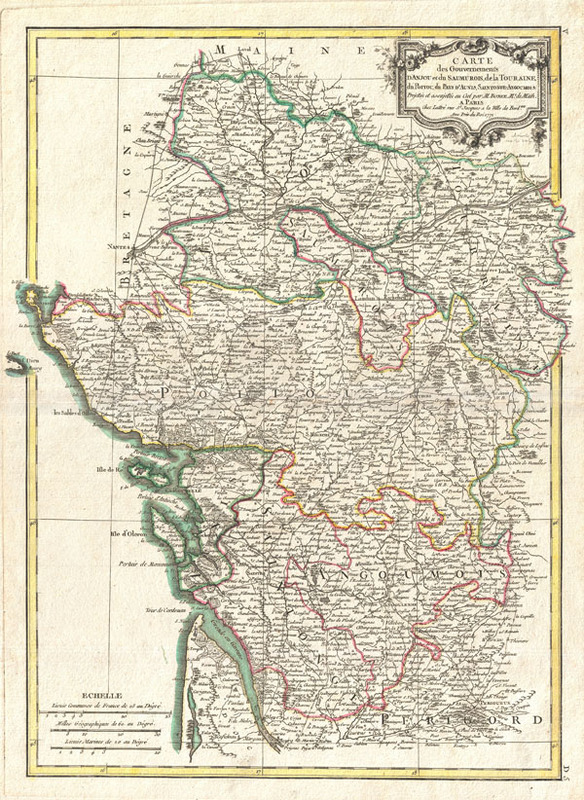 18th century map of the Anjou (Loire) wine region! Carte des Gouvernements D'Anjou et du Saumurois, de la Touraine,du Poitou, du Pays d'aunis, Saintonge-Angoumois. A beautiful example of Rigobert Bonne's decorative map of the French winemaking regions of Poitou, Touraine, Anjou, and Saumur. Covers the region in full from Maine to Perigord and from the Atlantic to Isle de France. This region, which hugs the Loire Valley, is famed for is beautiful Chateaux and for producing some of the world's finest wines. A large decorative title cartouche appears in the upper right quadrant. Drawn by R. Bonne in 1771 for issue as plate no. D 5 in Jean Lattre's 1776 issue of the Atlas Moderne. Very good condition. Minor toning along original centerfold. Blank on verso. Original platemark visible. Rumsey 2612.010. Phillips (Atlases) 664. National Maritime Museum, 215.